Summer’s winding down and there’s now a nice, crisp chill in the air during the evening time. Pretty soon, it’ll be chilly or cold enough to warrant some drinks to really warm the soul. But for now, it’s nice to savor the last few chances we have to enjoy the remnants of summertime. Summertime’s a magical time with long, bright evenings and lots going on around the city. That’s why September-October’s the best time in St. Louis… You get to savor the final fleeting moments of summer, while also enjoying a nice, chilly breeze in the evening time. A perfect balance between the fun summer and the cold winter. So while an almost unbearably cold time of the year is right around the corner, and soon I’ll be reaching for some cozy whiskey and scotch drinks inside the heated home… For now, I’m enjoying holding on to summer and being on the back porch for as long as I can. That’s why you’ll only find one “sneak peek” at winter drinks in this post (the Brigadier). For the most part, the drinks featured in this latest post are about as summery as you can get – The Americano, Planter’s Punch (meaning an actual punch shared by friends on a good ole St. Louis back porch Labor Day barbeque), and the Ramos Fizz. It really doesn’t get much more summery than these cocktails. And it really doesn’t get much better in general, no matter what time of the year, than these 3 cocktails. So shake and stir ’em up while you can, because winter’s almost here, and pretty soon we’ll all be sitting on our couches wrapped up in sweatshirts, wrapping our hands around some hot toddies or maybe a Brigadier. What a tasty drink! Here’s a drink that’s light & refreshing, while still definitely tasting like an adult beverage with its dryness. 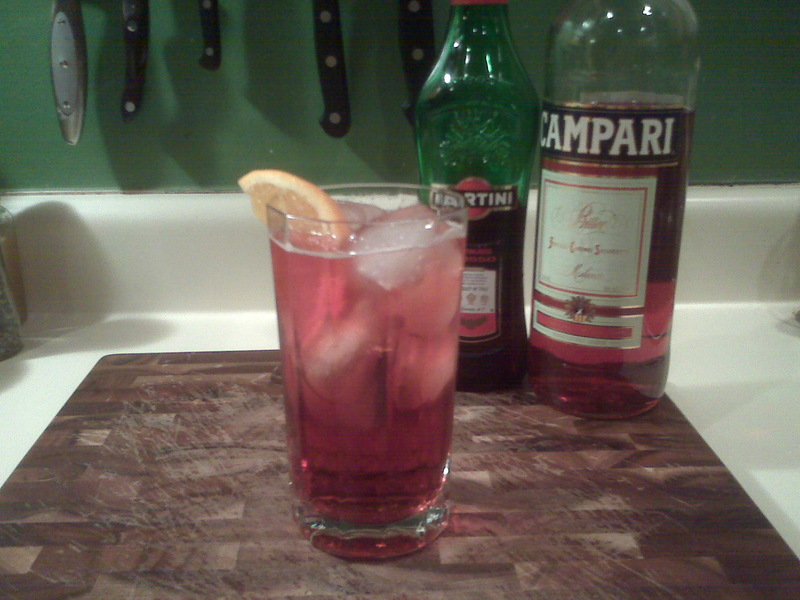 It’s nice and bittersweet, but not quite so bitter as a “Negroni”. This is definitely a back porch cooler. Pour into an ice-filled highball glass and stir, topping with club soda. Also known as the “New Orleans Fizz”, this amazing drink dates back to 1888. 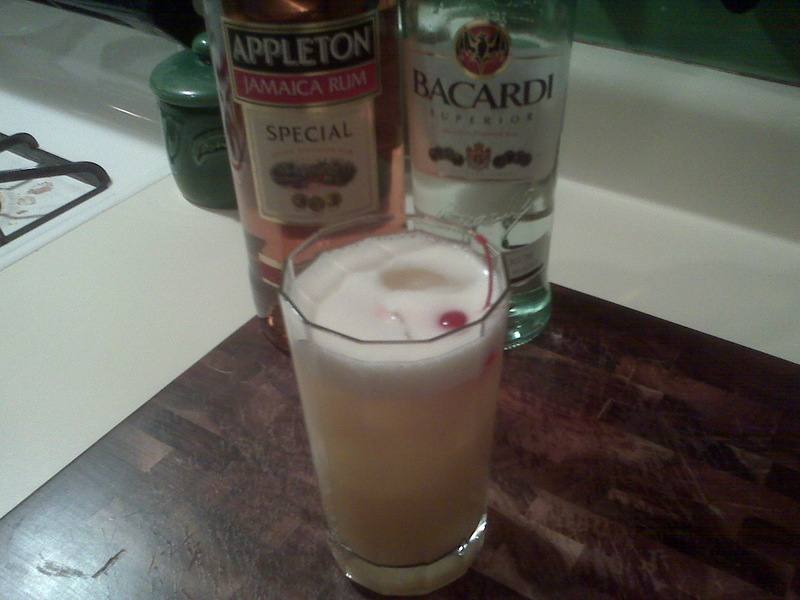 It was invented by its namesake, Henry Ramos, and I must say it’s a pretty decadent drink! It’s decadent in its appearance, it’s decadent in its taste and it’s decadent in its preparation. This drink calls for 2 things I’ve never used in a cocktail before – 1. orange flower water, and 2. an egg. While using egg whites in cocktails is not uncommon, this is the first time I’ve gotten around to actually using them myself. (I must admit, I was kind of intimidated by the thought of it, but that’s all behind me now.) 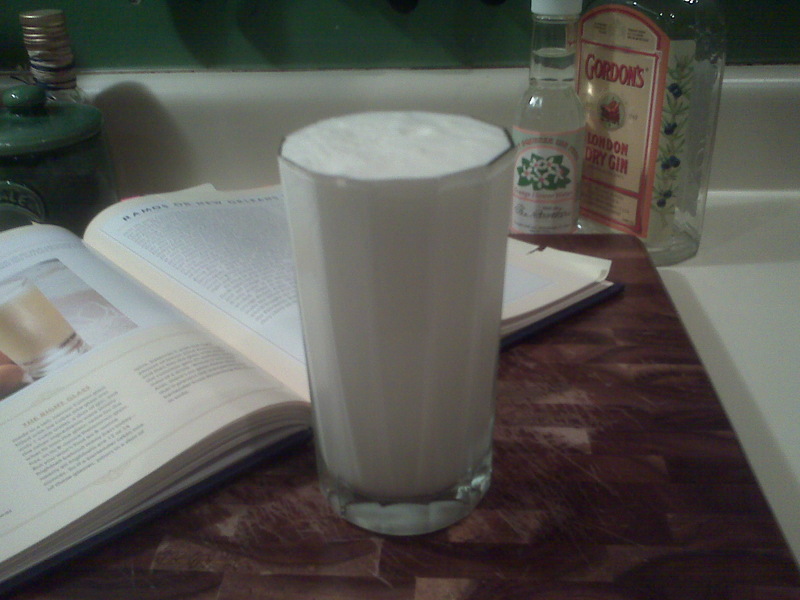 Since we’re using egg white to add body to the drink, we need to shake it with all our might… much longer than a regular cocktail. Some recipes say “shake it long & hard”, some say “shake it viciously”, some say “shake it for at least one minute, preferably two”. Like I said, I was a little weary of drinking raw egg, so I shook it intensely for about a minute and a half. I shook it so long that my hands were frozen and arms quite tired by the time I was done. A tip for next time would be to wrap a towel around the shaker before beginning. Also, I’ve read some where that one should not be so weary of the raw egg in cocktails because the alcohol, and the citric acid of lemon/lime called for in many drinks, diminishes the chances of salmonella. Anyways, enough about the egg… this drink is quite a drink! It’s a fantastic decadent drink! It’s thick & creamy, sweet & citrus-y! You feel like you’re on top of the world when you’re drinking one of these fellas! I highly recommend treating yourself to one of these. I just wouldn’t recommend mixing it up when you have multiple guests, unless you lift lots of weights and have very strong arms to handle the amount of shaking needed for multiple drinks of these. Shake vigorously for 1.5-2 minutes, and then pour in to a highball glass with no ice. Top with club soda. 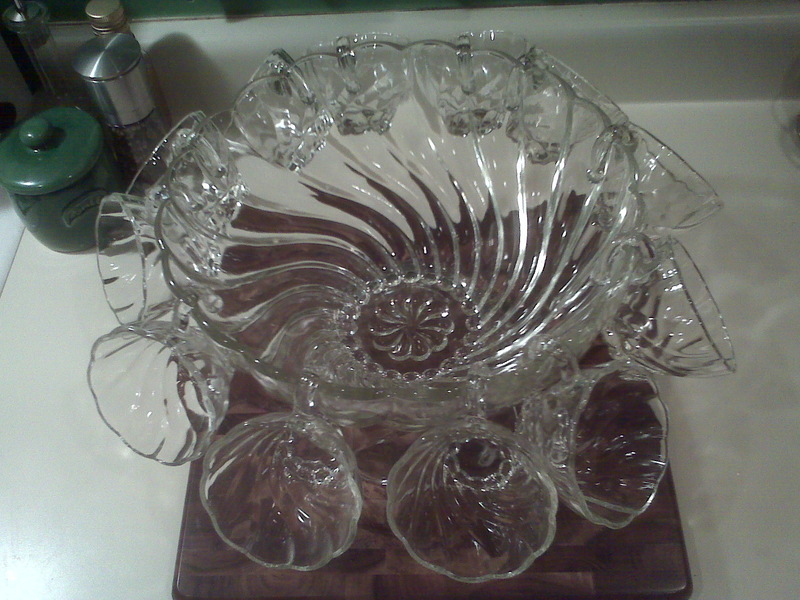 I finally bought my first punch bowl set! I’ve wanted one for quite some time, and a Labor Day barbeque seemed to be just the justification I needed to track one down. 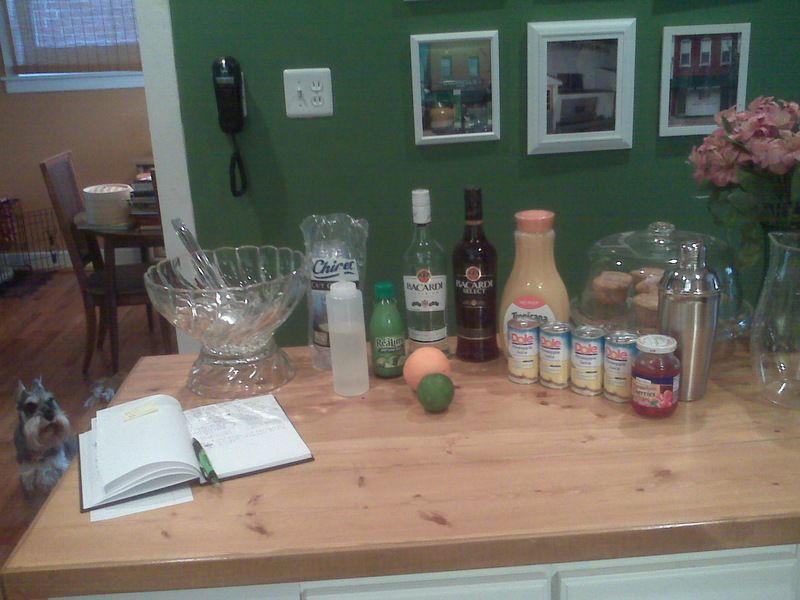 To break in my new punch bowl, I turned to one of the most famous punches, a classic rum punch called “Planter’s Punch”. I’m especially partial to the Planter’s Punch because one of the legends of its origin points to the early twentieth century in St. Louis. Many people think the punch was created at the Planter’s Hotel in St. Louis in the early 1900’s. Others think it was created by actual planters in Jamaica much earlier. Who knows for sure… I’m content to compromise and hypothesize that perhaps it was originally created by actual planters in Jamaica, and then later popularized in the U.S. at the Planter’s Hotel in St. Louis. That’s good enough for me! Anyways, it’s a really good drink. Good enough that I could see myself enjoying a whole punch bowl to myself if need be. So I mixed up a batch to bring to our friends’ home, transporting it in a plastic pitcher, and planning to take a photo once I assembled the punch at their home… but it slipped my mind! So unfortunately, I’m sad to say that I do not have a photo of my very first punch. I do however have a picture of the making of the punch, the packaging of the punch and a picture of my new punch bowl set, along with a picture of a Planter’s Punch solo-style in a highball glass. So below, for the mathematically challenged, I’ve listed two separate recipes – 1. a recipe for a single-serving drink, and 2. a multiplied recipe suitable for an 80 oz. punch bowl. Now since this was my first attempt at a punch, and I was also transporting it to a location in which I wasn’t sure of the set up, I did something I’m not sure I needed to do… Instead of just mixing all the ingredients together in the bowl and then adding a big ice chunk, I shook two servings in a shaker to get the right proportion of water added to the drink from the ice, and then poured them in to the jug. I did this 6 times I think. This way, I knew that whatever the circumstances turned out to be, the drink would taste just right. I’m not sure if this was totally necessary, but it turned out well, so it was worth the extra work of shaking. Again, I guess the theme of this blog post is being exhausted from shaking so long. Shake well and strain in to an ice-filled highball glass. Totals 74.25 ounces, plus the water added from shaking with ice (or an ice chunk added later). And last but not least, the sign of winter coming… The nice, crisp chill in the air that’s such a relief from the hot summer right now will soon turn to blustery, cold winds and ice storms. Let us be prepared – Stock up your cupboards with hot cocoa, whiskey, scotch and Chartreuse! The final drink of this post is definitely a warmer-upper on a cold winter night. 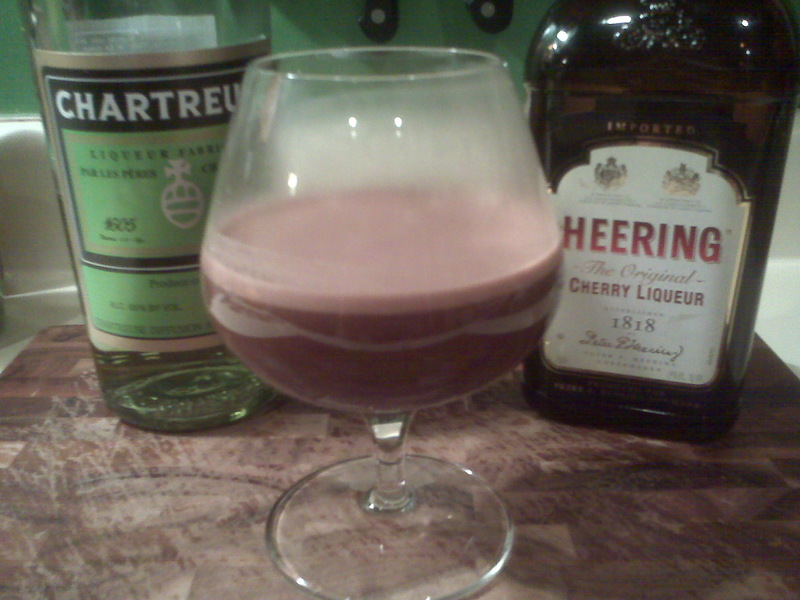 Not only will the hot cocoa warm you up, but there’s quite a kick right away that’ll heat you up… The Chartreuse hits you right away with quite a hot & spicy note, and then fades away in to a dark, rich cherry-chocolate flavor with the Cherry Heering and hot cocoa. This is definitely a drink that’ll keep you company when you’re staying inside to escape the assault of the cold.